So I was having a look at the suggested reading in the learning folder and decided to look up the UK Fashion and Textile association http://www.ukft.org. If you go to the ‘business’ tab and select ‘publications’ you can find a document that they publish (I assume every year) called the British Textile Colour Card. Which is a collection of colour schemes that are, forgive the Zoolander phrase, ‘so hot right now’. Not just the colours but a lowdown on the mood that they embody and also some close ups of some amazing current textiles that blend into that theme. 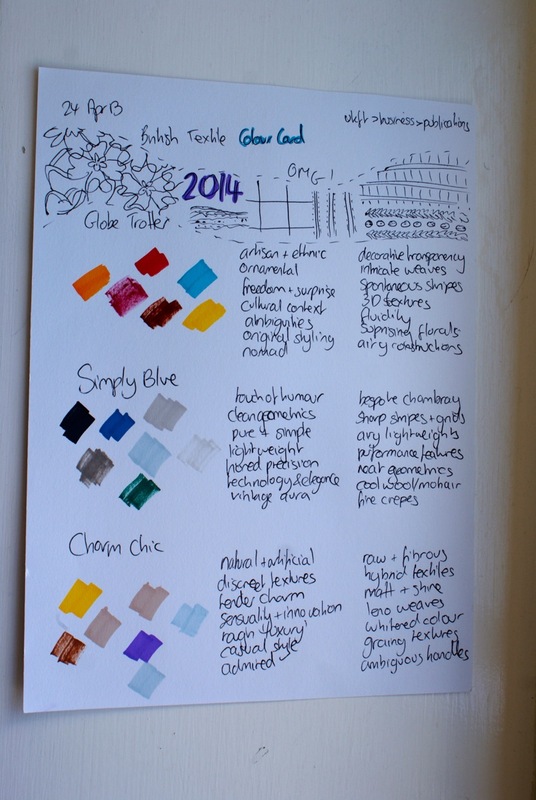 So heres also a link direct to the British Textile Colour Card 2014[pdf]. 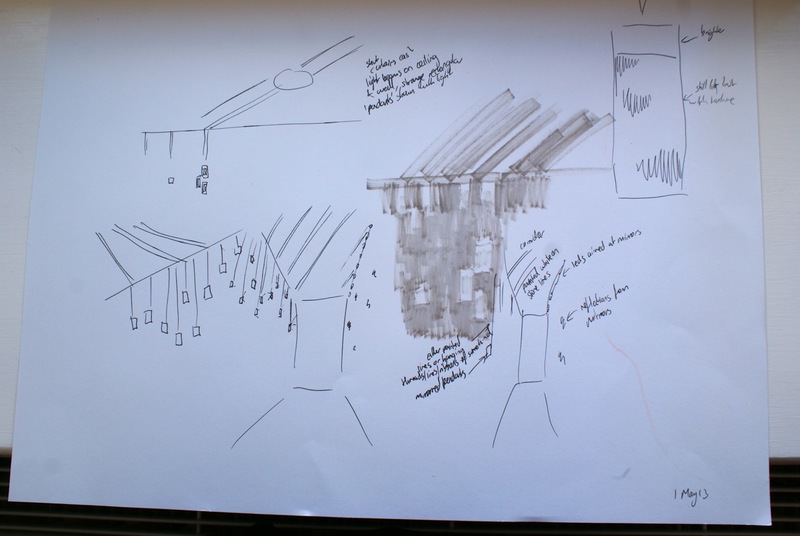 This was my attempts to get down on paper ideas I had buzzing around my head inspired by combinations of Pinterest, the Southbank Centre’s light show exhibition and architecture/interior sketches that I’m doing all the time separate from textiles course sketches. It is a sad looking piece of A3 mainly due to the lack of resources I have in London with me in my little uninspiring room! I can however say with perfect certainty that I know exactly what I am taking about here, have figured out the proportions I would like should this be done in the future, and most importantly, the obsession buzz was quietened by getting the idea out on paper. I was also attempting to use A3. Not loving it so far…! Again with the forcing A3, this was me planning out my final section of Stage 6. 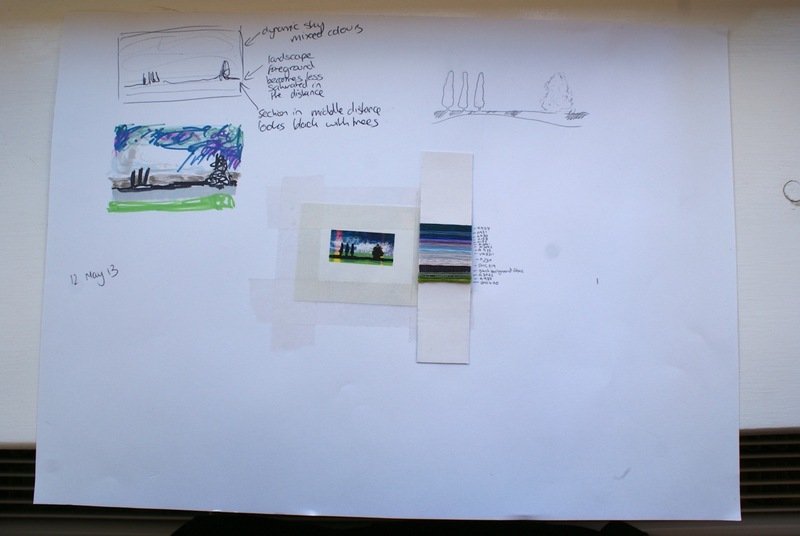 I’m rotating back to the landscape, stormy colours and trees theme that has been running through my sketchbook work to “develop in terms of image making”. So this is me working out my idea on paper first with colour pencils before making may sample based on that imagery. I love the yarn wrapping – I’m using the techniques I’ve learned to develop my work. After the slate sample I wasn’t happy with in assignment 1 I’m glad I did this so I know my colours and threads look pretty darn good together. I also used MS Paint to kind of ‘pixellate’ my image since I was working with french knots, and also drew the silhouette that will be the background fabric showing through the stitching. I’m still not loving working with A3. I write and draw so small – need to work on that so that all that white space doesn’t look so lonely! I was going to introduce this sketch by saying “in a book unrelated to textiles…” but that wouldn’t strictly be true because its a design book. So: In a design book “Creative Workshop: 80 challenges to sharpen your design skills” by David Sherwin I was reading how sometimes the best creativity comes by making fast decisions and throwing out all kinds of ideas. 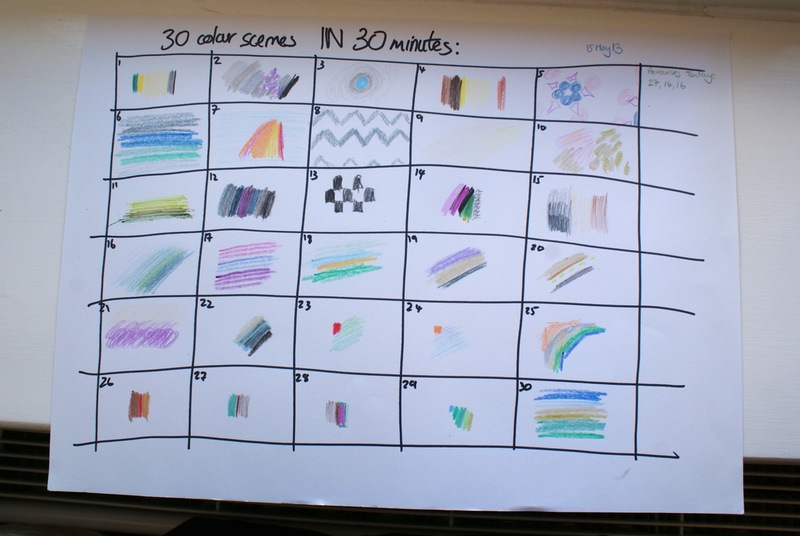 The 80 challenges give time frames that range from 30 minutes to 2 hours and he makes a point that you can do great things in such short timespans. So I applied this and tried it out with some colour combos. I set a bleeping timer on my phone to remind me to think quick and move on! I noted my favourite combos on the right and plant to revisit every so often to see if my tastes change with the seasons/fashions/my own learning.